Several columns need to have exactly the same width so that the table looks neat and uniform. First select all desired columns by keeping [Ctrl] pressed and then click the column headings one after the other. In order to select adjacent columns, you can click the heading of the left column, then keep the [Shift] key pressed and then click the heading of the right column. Alternatively, you can keep the mouse button pressed and drag the cursor over the column headings to be selected. Move the cursor to the right border of the heading of one of the selected columns. As soon as the display changes and the cursor becomes a vertical line with a horizontal double arrow, press the left mouse button. You can modify the column width as long as you keep the mouse button pressed. Here, Excel informs you about the current width. 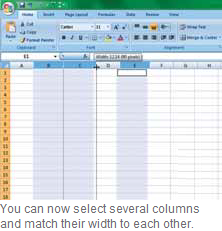 As soon as you release the mouse button, Excel adjusts the widths of all selected columns to the modified width. You can also specify an accurate value for the column width. For this, right-click on the selection, select ‘Column width’ and enter the desired value in the dialog. After clicking ‘OK’, Excel adjusts the fi elds. Even the height of several rows can be adjusted using the described procedure.